Since we’ve built them, one of my very favorite places to decorate and change things up, is the dining room shelves. 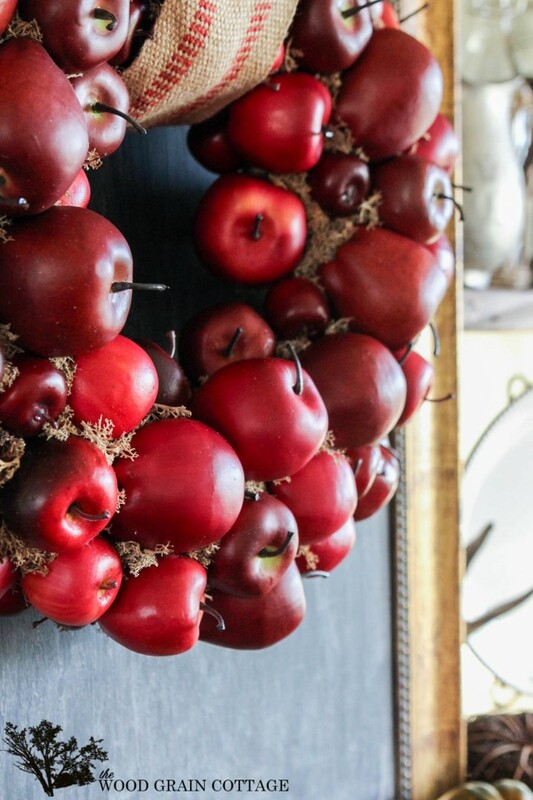 And for fall, I kept imagining a huge wreath full of apples hanging off my recent chalkboard picture frame. Apples are one of my very favorite things to decorate with for fall, so when it came to start bringing in those natural elements, I decided to make my own DIY apple wreath. Faux apples, in a variety of sizes. These are all similar options (here, here, here). Then, I grabbed my apples of various sizes and started hot gluing them onto the form…. And with that, it was ready to hang! Those dining room shelves have been really fun to decorate these past few days. 😀 Anthony and I have also been busy making a few new fall/ winter projects and working on a big painting project. oOOOO, I Love it!! Looks so pretty and can’t wait till Friday! That is so beautiful. I’ve been looking at wreath ideas all day today and didn’t want to stick with the traditional orange for fall. This wreath will be perfect!! Thanks for sharing. Now I need to run and get some supplies. P.S. I love your site and your great ideas. I love it too, looking forward to your fall inspiration. Oh my gosh Shayna I love everything about this. It’s beautiful! This is so beautiful and unique. Thank you for sharing! I love it, and now I want to go buy some fake apples to decorate with! This is so beautiful and refreshing! Thanks for sharing. I absolutely LOVE it! So gorgeous! I’m pinning! Love this! So easy yet so awesome. Can’t wait to see what you have on Friday! Love your blog!! love it. can you tell me were you got the apples and i have never heard of natural filler what is it? Beautiful wreath!! I’ve been looking for nice looking fake apples. All the ones I’ve found seem so fake but yours look so real. Would love to know where you got them? Love this! I think I’ll try it out this weekend. Hi Shayna. It’s so nice to meet you through discovering your lovely blog and mad DIY apple wreath making skills! I could not hit the Pin It button fast enough. Good news and great projects travel fast. The wreath is simply done, naturally beautiful and a fall focal point- the best way to decorate in my opinion. Your projects are all so wonderful and creative! I’m looking for red stripe fabrics for our home (for a decent price), Where did you get this red stripe wreath hanger? I also noticed all of your red stripe napkins, and even a pillow. Where did you find your’s? Thank you very much! I am making this as soon as possible! This would be an incredible teacher appreciation gift too. An apple wreath for a teacher? How stinking cute would that be? Pinning now! I love this wreath! Great idea to use the fake apples, I am so stealing this one! This is one of the cutest things I have seen on Pinterest in a long time!! Can you tell us where you bought those apples and how much they were? I would love to make one of these! Did you glue the natural filler in place or just stuff it into the holes? Thanks! I cannot wait to make this! Gorgeous! What size foam wreath did you use? Thanks! So pretty, and perfect for fall. I’m sharing! Hi Melissa! I found the apples are three different craft stores, Hobbby Lobby, Michaels, and a small local store. They each carried a different size, which was helpful! I hope that helps! I started working at White House Foods about two months ago (they make White House Applesauce and Vinegar products). And…. I just got moved into my very own little office. That has absolutely NOTHING on the walls and no window (better than sharing an office though! – I’m an accountant and need my peace and quiet lol). Sooooo I just might pick the stuff up to make this!!! Perfect!!! Hello, I love your wreath!!!! I really want to make one of these but need help finding the apples. My michaels didn’t have them. Do u know the specific brands you used? I was thinking maybe I can order them on Amazon? Can you help!? Thank you !!!!!! Hello, I love your wreath!!! I just made this wreath and it looks great! I’m at a standstill because I’m unsure how you connected the strap and how did you hang it? This is really beautiful! I love the apples as an alternative to pumpkins for fall. I shared this as part of a fall wreath diy round-up on my blog- if you’d like to check it out. Thanks so much the inspiration!